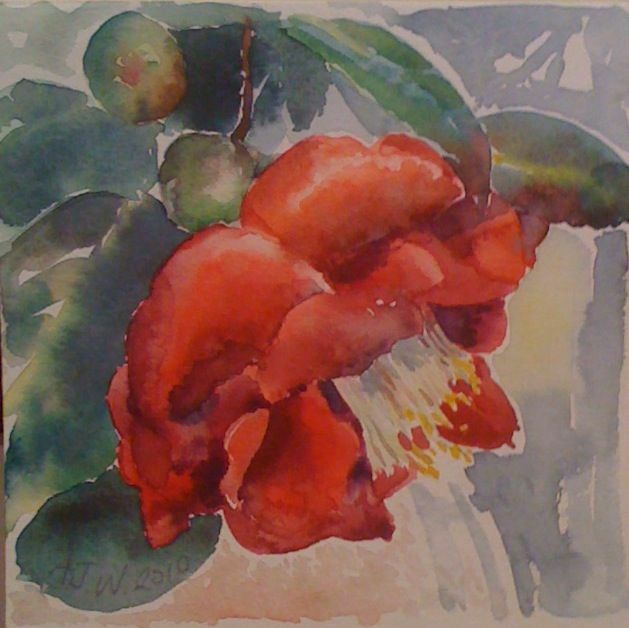 I cut the camellia flowers at my mum’s house, things are further out there, here we are on the edge of a frost pocket. It’s drawn life size; these really are big and in your face red. She sat and did the cross word while I painted and told me that I was going to regret launching a painting a day as it would be too demanding. I got out a tube of red to help me get closer to the red here, the reds in the pans fall one either side of this red. Geography course work came back finally, son who has no ability with tact said “Why did it take so long to mark?” He was told that there was a reason and that the reason would be given to his mother….she is waiting. No1 son came home smelling of fritters or doughnuts yesterday, how did it go? He had made everything he set out to do, he said, and eaten the lot for lunch, so had eaten an onion, garlic and ginger, chilli some prawns, a green pepper, two tomatoes, four potatoes, and a banana, all fried, then he had been offered surplus doughnuts made by someone else, he ate three, and still managed some cake from one of the girls……the wonder is he’s as thin as a rake still. Oh yes and then we took mother out to a pub for a late Mother’s day treat in the evening and he ate a big two course meal with ease. I had ham hock in a spring broth which was a kind of transition meal somewhere between a wintery dish and a lighter summery thing. It had beautiful white beans in it, fennel and tiny kale leaves. 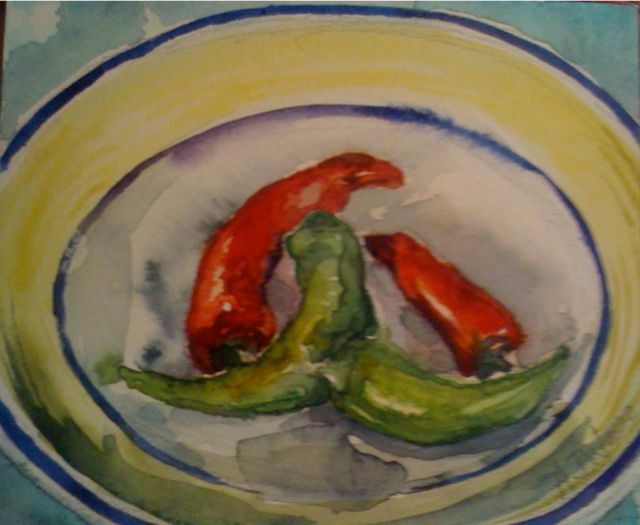 In honour of the curry, the remaining chilli peppers today in a yellow bowl, I seem to be slightly better today but I like one of the chilli peppers better than the rest, it would work better if they were all as good as each other. I’ll try garlic, I like garlic both to eat and paint. It has a magic shape quite prim and organised and then you break it open to cook with it and the tight skin unravels in a chaotic flaky mess and the colours emerge on the side of each clove. 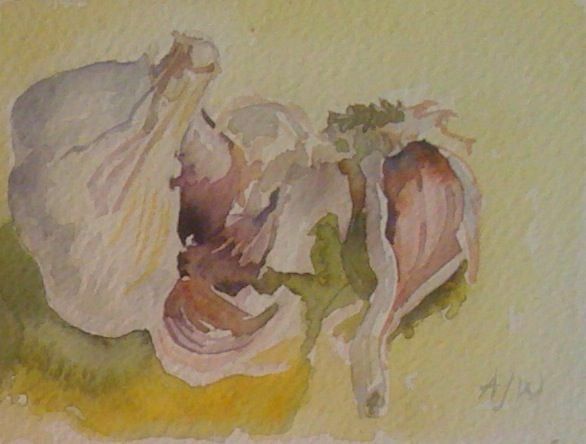 When I did a pottery class I wanted to make a vase in the shape of a head of garlic, it would have been white porcelain had I ever got to grips with the porcelain clay which can slump and fold up in the kiln. That’s an example of an idea which was perfect until I tried to actually realise it in 3d. The garlic is only so so, I will come back to it again or rather a different piece as no.1 son wants to make curry and chips and banana fritters in his final cooking practical. “Not very balanced “we said, his eyes began to bulge “So? We can do what we want today and I like the idea”. 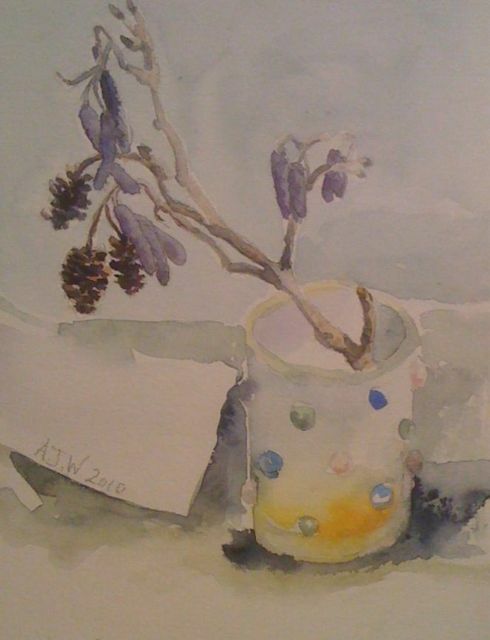 I moved the lemons and did them in extreme wet on wet, I like the random way the paint flows sometimes, ok not entirely random, if it goes in completely the wrong direction I just blot it up with bog roll and try again or tip the pad so it flows off somewhere better. 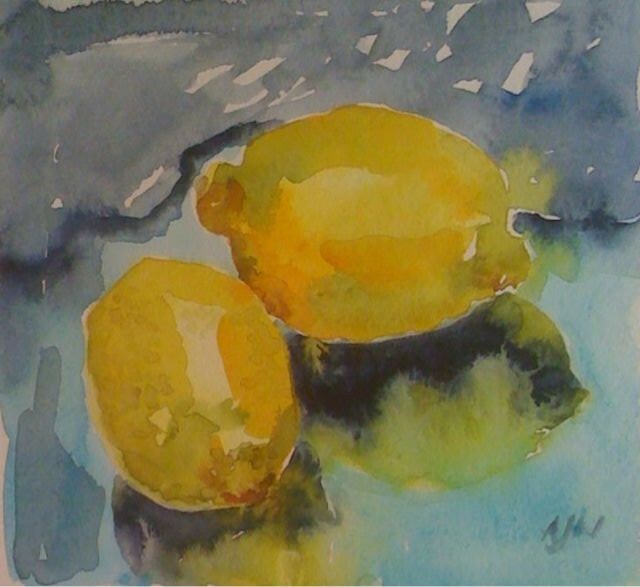 These lemons are sat on the plate glass I use for rolling printing ink; I really like the watery blue that you get in thick glass. I forgot to mention yesterday I found quite a lot of ear fungus growing on some sickly looking elder trees half way up the downs. As I think they taste like crunching on a real ear they are not my favourite so I dropped them off at my favourite gastro-pub on the way home. So after the lemons I went back to the garden for a little string of acorns that made me think of winter, it’s still quite wintery at times although the daffodils are actually out. The’ February Gold’ opened three weeks into March which has happened before but recently it had been living up to its name and opening in February. There were no free daffodils from the roundabout this year for the cheeky kids who pick them on Mothers Day, none open; still at least their Mums get flowers most years , I get a cup of tea in bed followed if I’m lucky by breakfast in bed . The best part about it is listening to the arguments and flaps downstairs I have to brace myself not to go down and sort it all out sometimes. 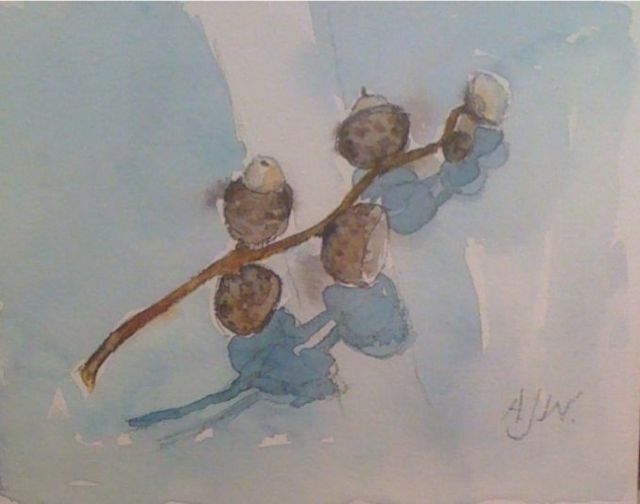 This is a blog of two or three parts, it will have a painting every day or a drawing or a print. There will be pictures of the food I buy or cook and of the garden or things from the garden. This is where I spend my time ; on the phone to the school about teachers who persist in not marking homework, in the studio trying to forget about unfinished GCSE course work , in the garden trying to tackle the weeds and the grubs, in the kitchen, either making something that will do, or in the kitchen enjoying making something different. Before you ask, no, it’s none of it idyllic or remotely perfect. I could make it look/sound that way by being really selective, but I shall try not to. When I write something I will most likely be rude about things or people, as it is what I do best, and it seems like a really good opportunity. After all there is such a wealth of stuff to complain about. 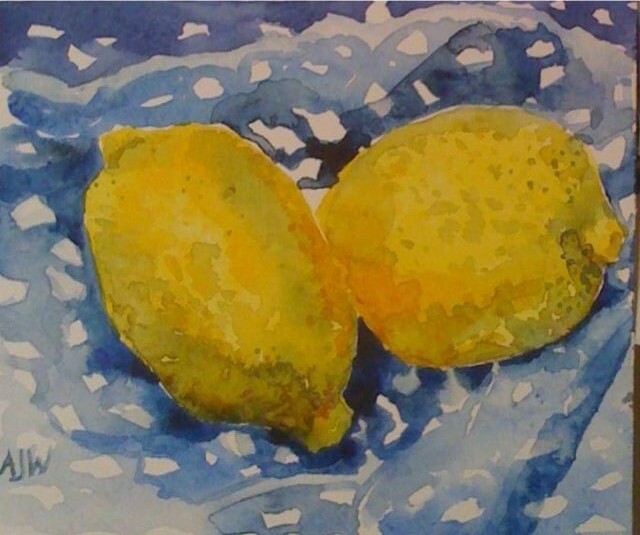 Today I painted two lemons on a blue cloth in watercolour just to see what they came out like…ok. Tomorrow I shall find something from the garden and also get some prints ready to sell. I shall continue to chase the deputy head who has not marked my sons course work since at least January 25th when he wrote to us complaining it had not been handed in…it was on his desk all the time we discovered after we had had the house turned upside down and the mother of ‘don’t lose your homework ever again’ rows. When I was at school I spent my time hiding from teachers who were chasing me for homework which I had not done , now I am chasing teachers for my sons homework they have not marked. I suppose the teachers are from my generation and we are all monumental skivers.